The all-new Champion Power Equipment 3500W digital hybrid review. An open frame style, digital hybrid generator with inverter technology, meaning it’s an inverter generator mounted on an open frame. The digital hybrid does not refer to a dual fuel generator, but rather the design. The open frame design gives space for a larger engine which allows for more power. While the inverter technology allows it to produce pure sine wave energy that is safe for sensitive electronic devices. In addition, the incorporated quiet technology in this unit allows it to keep the noise level down during operation. Furthermore, it’s parallel capability, allowing you to double your power by connecting it to another unit for future convenience. Fuel efficient with enough power to run an average air conditioning unit. A huge amount of power packed into a smaller design. 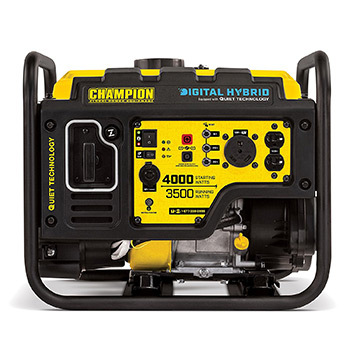 The Champion Power Equipment RV ready digital hybrid, a cost-effective and convenient portable power option. Ready to power your critical applications at home during a power outage, and just as its name says it’s also RV ready. 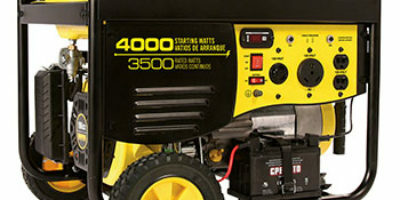 Champion Power Equipment 100302, rated at 3500 running watts and 4000 starting watts. The incorporated inverter technology allows for quieter performance and lighter design than the average 3500W range portable generators. Comes fully assembled with a durable open steel frame design. Powered by a reliable 224 cc. Champion single-cylinder 4-stroke OHV engine. Has a gas tank of 2.9 gallons. With an extended run time of up to 17 hours at quarter load on a full tank of gasoline. Producing stable sine wave energy with less than 3% THD, clean electricity for powering sensitive electronics, such as computers and smartphones. This machine is also capable of starting and running a 15,000 BTU RV air conditioning unit. Fuel efficient with its smart economy mode, it varies the engine speed based on the required load. As the electric load is reduced the engine automatically idles its speed allowing for fuel economy, quiet operation, as well as good engine life. A low decibel generator, 23 feet away and its noise level is 64 decibels at quarter load. It’s also parallel ready with the ability to connect with another digital hybrid unit or other compatible 2800W+ inverter units. Starting this machine is easy with a recoil start. Armed with an automatic low oil shut-off sensor and automatic voltage regulator. Features a quick touch panel, easily accessing all controls in one convenient area. Comes with two household 120V,20A outlets, one RV locking 120V,30A outlet, and also includes DC automotive 12V outlets with USB adapters and battery charging cables. All are overload protected. USDA approved spark arrestor, EPA, and CARB compliant. Cost effective unit backed by a reliable manufacturer and a 3-year household limited warranty. Weighing almost 82 pounds, the Champion Power Equipment digital hybrid is not lightweight and lacks wheels. For portability, a wheel kit is sold separately. At 64 decibels when at 25% of the rated load is not very quiet. Adding fuel might be a challenge unless you go slow and careful. Easy to accidentally splash out when adding gasoline. Check the user manual PDF. Lacks an electric start feature for extra convenience. Recommended Oil SAE 10W-30: Champion Power Equipment recommends running the generator for 5 hours to break it in, and then changing the oil. Oil Capacity 0.6 qt. Mobility Kit: Includes two never-flat wheels, support leg, and fold-away handle. Parallel Kit: Designed to integrate seamlessly between two units. Includes additional 120V outlets. Storm Shield: Waterproof cover supported by high strength frame rods that withstand strong wind, rain, and snow. Allowing for plenty of natural airflow to the generator during operation. Cover: Durable, waterproof cover for properly storing your machine away from dust and dirt. 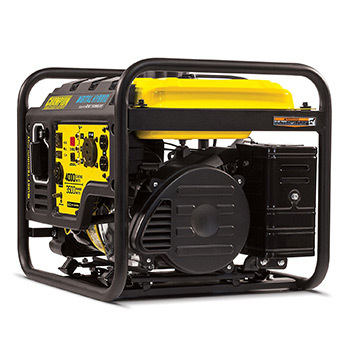 Overall, the Champion Power Equipment RV ready portable generator is a great, economic, and powerful machine. Ideal for tailgating, camping, travel trailer and can serve as backup power for your home as well. Between its ability to power sensitive electronics, and run an RV 15,000 BTU AC, or power your home appliances in emergency situations. It’s a lot of power packed into a smaller size unit. It can even run 1 or 2 small power tools for your remote project. Generators are not quiet by nature, but this one does a good job of muffling the sound. It may be a bit noisy, however, that’s expected due to being an open frame design. Which on the other hand allows for more power incorporated by inverter technology. Furthermore, with such a large fuel tank and smart economy mode, it’s fuel efficient and will save you money. Parallel capable with a competitive price tag. Backed by a 3-year warranty which shows the trust the manufacturer has for this unit. It may be a bit on the heavy side but it has rugged handles that allow it to be easily carried by two. Not to mention, you can always go for the separate mobility kit. 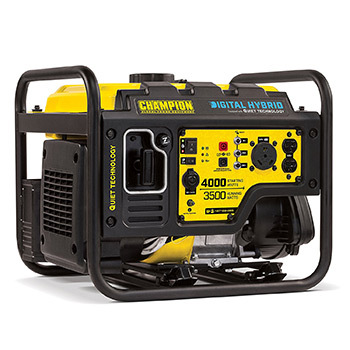 The Champion Power Equipment 3500W digital hybrid review discussed the key features, pros, and cons of this digital hybrid style model. Champion Power Equipment 3500W digital hybrid RV ready portable generator with quiet technology, a cost effective and convenient portable power option.